For those of you who don’t know, this is not my first time going to Mackinac Island, it was Al’s though. My first time was with my family and grand parents back in 1971, just before I turned 5. The only reason why I know we took Arnold Transit Co. ferry over to the island was the pictures my grandfather Norman Braton took of us. He and Grandma Barbara came with us on the trip too. It was a trip down memory lane to go back using the same ferry company. Here are the old pictures of back then. Since my family couldn’t join us, I made a picture where we are all together, this is the island dock. That is no longer an empty patch of grass, Mackinac Cycle is now in this spot. Here I am just before dis-embarking. The seats are still green too! There are three ferry services to take people to the island, the others are Shepler’s Mackinac Island Ferry and Star Line Hydro-Jet® Ferry. The other companies focus on the fastest speed to the island, we wanted to take our time and enjoy the sights along the way, and be able to take pictures too. We did see the other two on the way to the island as well at the same time. 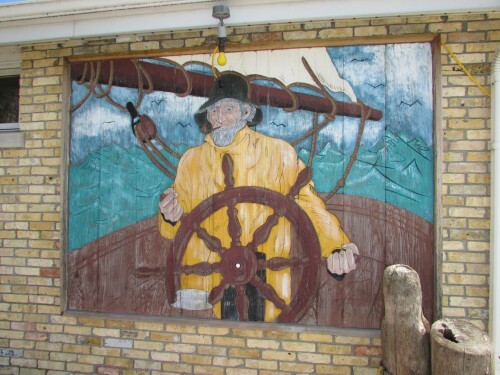 You can also get all three across the bridge in St. Ignace too. Forty five years later, I was looking forward to taking Arnold back to Mackinac Island. It would have been great to have the rest of my family there too with us but that was impossible at this time. View from the bow looking toward the pilot house. Our ship is the Chippewa, the fleet are named after American Indian tribes predominant in the area. You can move about while the ship is in transit to get the best views. The stairway leads to the enclosed area and restroom. Arnold is the only ferry service with a restroom, another plus! Al and I arrived at just past 11:00 AM on June 21. 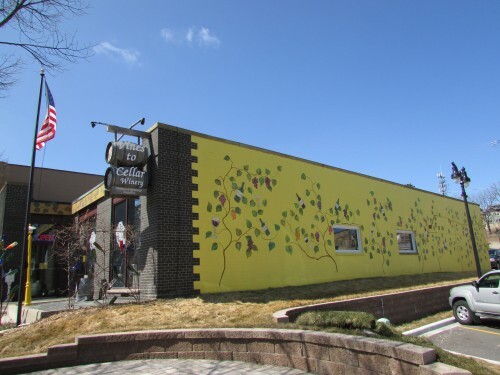 The staff are very helpful and explained how things worked in a friendly way to us newbies. They marked our extra bags to be sent to the Murray Hotel where we were spending the night. Our bikes were stowed below and we went to the upper deck to enjoy the view. It is chilly on the lake, even in June so be sure to dress warmly. We were ready for the 12:00 departure. Join us on our exciting 40-minute trip, thanks Al for your work filming our ride! We could even see the Icebreaker Mackinaw Maritime Museum from there. We were going to be seeing that on Thursday after our return to Mackinaw City. We also saw our first freighter pass under the Mighty Mack, or Mackinac Bridge. The bridge is just short of 5 miles across, longer even than the Golden Gate. It’s called the Federal Biscay from the Marshall Islands. It was especially fun seeing the same views my grandfather had when we enjoyed our first trip to the island, I tried to duplicate them. You could see the Grand Hotel all the way from Mackinaw City it is so big, this is my Grandpa’s view 45 years ago. The slide is no longer sharp. The houses to the left are on the West Bluff. And the view now, there is no longer a water tower overlooking the Grand Hotel, or it is no longer visible due to tree growth. The Ottawa passed us by as it headed back to Mackinaw City. Not many people going back. If you think about it, who really wants to? As we rounded the island, more landmarks came into view, areas we would be familiar with only a few hours later. This is a view just past the end of Main Street, the blue building is the Public Library, we are just past Windmere Point. The Governor’s Residence is overlooking the scene. We didn’t get time to do a close-up. This is the approximately same view from shore. We came around the Round Island Lighthouse and it was time to get closeups! Also got in a sail boater and a couple kayaks too! Now we approach the harbor with great excitement and downtown came into view. My Grandfather’s view of Fort Mackinac at the top of the hill from the water, and then my view. I didn’t quite get the same angle but it still is good. We are here! Thanks Captain for the safe trip to this isle of adventure. The view then and now from the dock. Goodbye Chippewa for now, you are a fine ship. Our adventure here begins! Star Line is in the process of purchasing Arnold. Read more about it here. 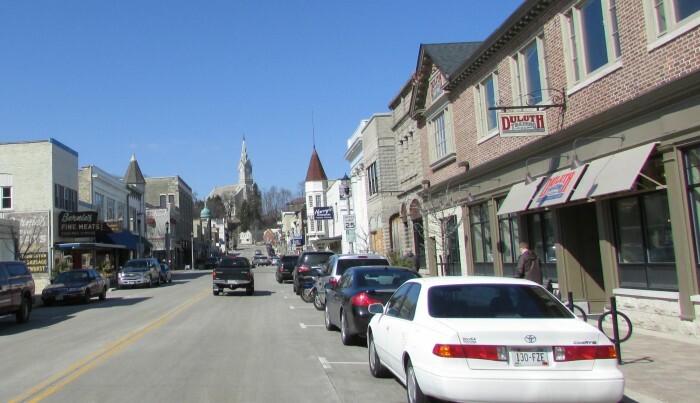 Port Washington is a charming harbor community of 11,500 on the shores of Lake Michigan, about 30 miles north of Milwaukee. Al was here when he was a teen, but I had never been there before. 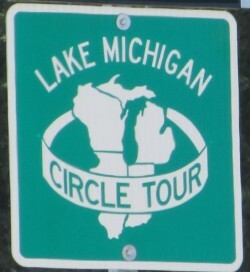 Port Washington also is part of the Lake Michigan Circle Tour, something we hope to do someday. 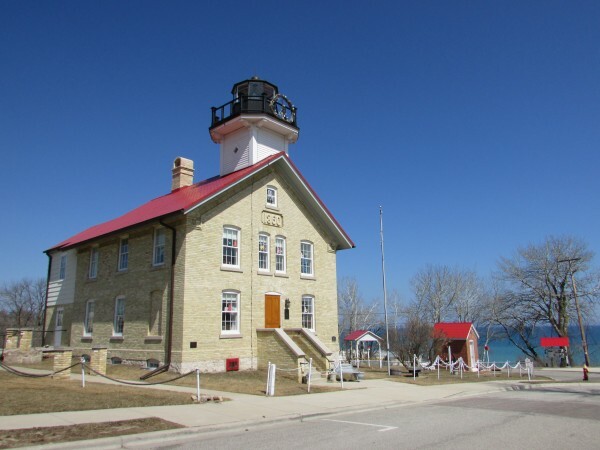 We had already been to several cities on the tour: Chicago, Milwaukee, Green Bay, Sheboygan, Manitowoc, and Sturgeon Bay. It was time for lunch, and we saw a Brat(wurst) Fry in a parking lot. We stopped and got a couple. Lunch done, we headed to the 1860 Light Station and Museum on St. Mary’s Hill. 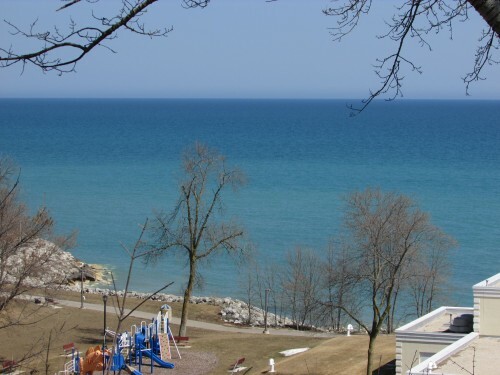 The view offered a beautiful view of Lake Michigan, looking blue as the ocean. 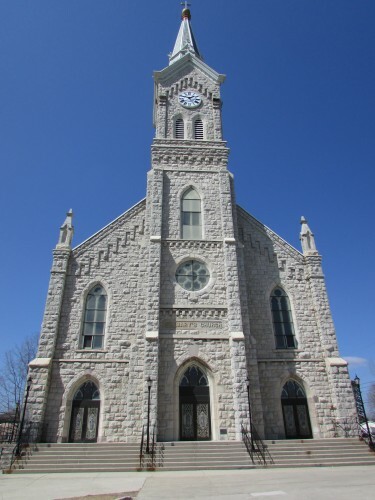 We also took a look at St. Mary’s Church, a beautiful church that overlooks the city’s historic downtown. We went down the hill to see downtown and the Breakwater Light House. You can see the church overlooking downtown. 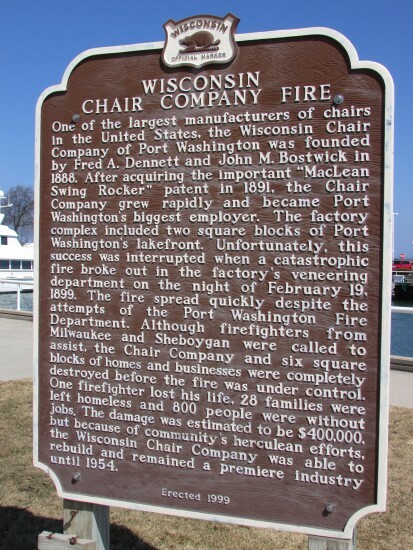 As we walked toward the Marina, we saw this historic marker. 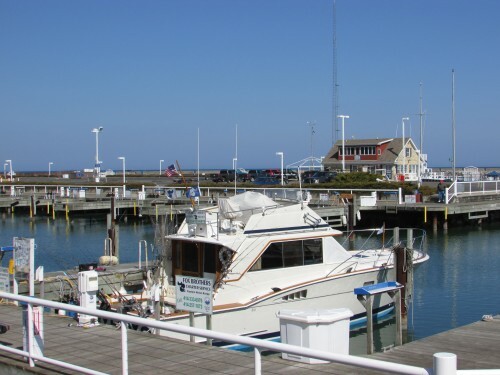 A view of the Marina, with the control building in view. 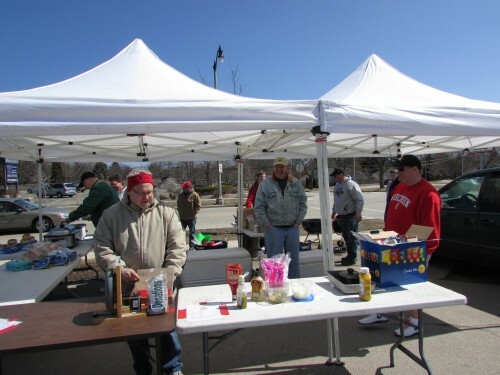 There are many Fishing Charters for hire. 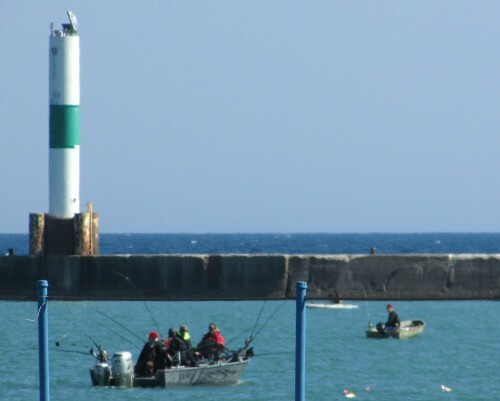 In fact, we saw a boat full of fishermen heading out into the lake. 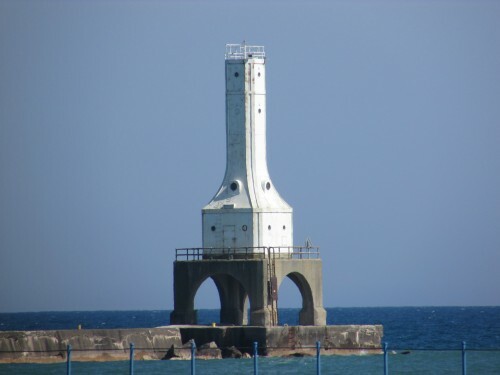 Afternoon or a cloudy day is the best time to see the light house so the sun hits the west side of it. It contrasted with the blue sky perfectly! There were many interesting businesses downtown. 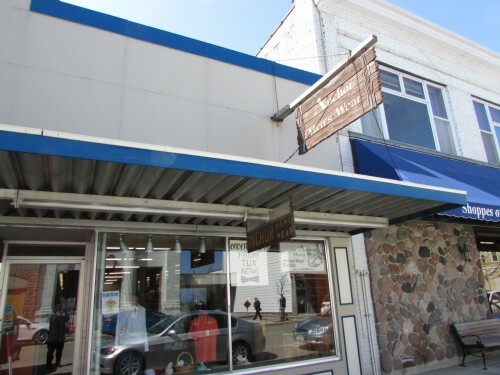 A Duluth Trading Company. 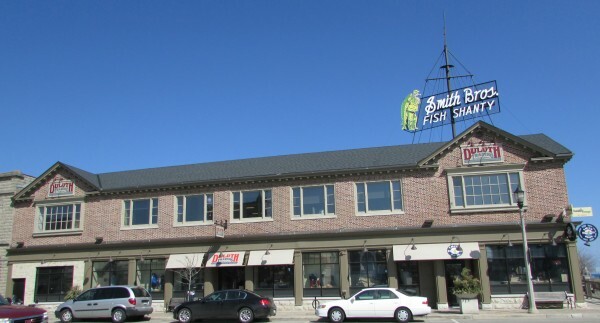 It is in the former Smith Brothers Fish Shanty building. The sign was left up as it is an iconic part of the historic building. The other other brick and mortar store is in Mt. Horeb. Also Vines to Cellar Winery. To look sharp lakeside, Anchor Menswear has great clothes. Victor’s Pier Street Shanty Restaurant. Dockside Deli, near marker we saw. 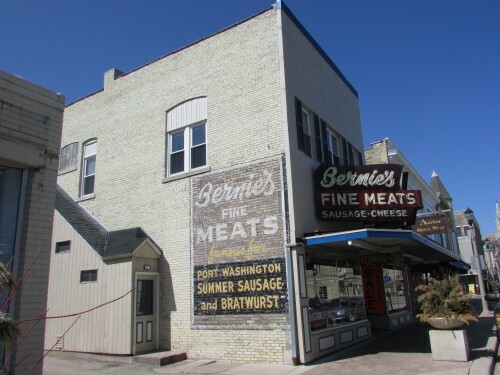 Our last stop was Bernie’s Fine Meats, great meats made on site. Brats and sausages for the grill! Friendly staff there, they will happy slice meat to order 🙂 Also a selection of wine and beer. 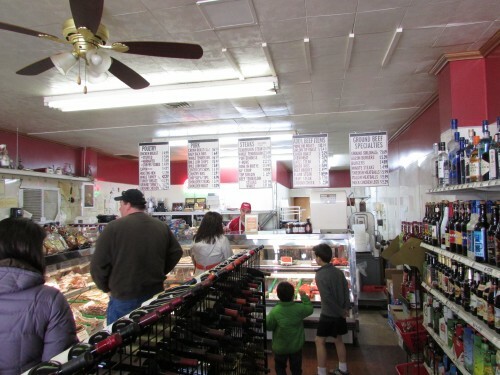 We got a pound of summer sausage to bring home, yum! 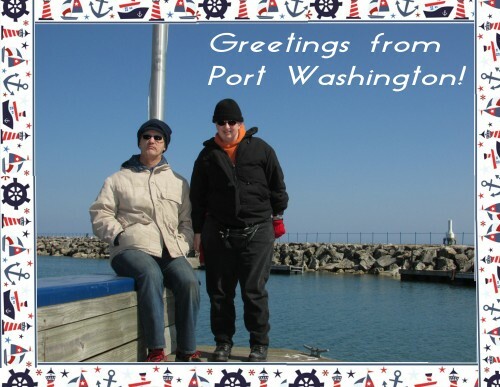 We enjoyed our visit to Port Washington and the quaint Marine atmosphere made us feel right at home.